This is the second in Peter Newman's Vagrant trilogy, and as with the first it's a damn fine read. Whereas the first novel followed the titular character, the Vagrant, here we journey with his adopted daughter, Vesper, as she unwittingly gets herself dragged into an epic quest to defeat the largest and most powerful infernal to ever crawl out of the Breach. Vesper is an unusual hero. She all but drags herself into an adventure she knows nothing of, and is wholly unprepared for the terror and chaos she faces during her journey, but rather than trying to escape her fate she approaches every challenge with conviction, with the belief that she is doing what needs to be done. Travelling with her are Duet (one half of a harmonised pair charged with guarding Vesper) and a young goat who seems to enjoy the adventure far more than his companions. As they gradually make their way south to the Breach they encounter various remnants of the demonic armies left over in the aftermath of book one (The Vagrant), making friends and enemies as they go. Setting-wise, the world of this trilogy is an interesting mix of post-apocalyptic nightmare coupled with some slightly more traditional elements of fantasy. It has righteous knights in shiny armour, but it also has airships, submarines and bio-engineered critters. In occasional interlude chapters we're gradually shown how the world came to be the way it is, how the Breach was first discovered, and why the world's protectors, The Seven, were created. It's a world brought low, with little hope of salvation even for those fortunate enough to live under the protection of The Seven and The Shining City. Stylistically, Peter Newman's writing leans very much in the direction of literary prose, reminiscent in some ways of Cormac McCarthy or China Miéville. For me this just adds to the book's charm, giving the narrative a strength I don't think it would have had with a more traditional style, and while the prose may be sparse, barely a word of it is wasted. This is showing not telling at its finest. While I can see that Newman's style might not be to everyone's liking, if you like fantasy that's decidedly different to the traditional fare then I'd still suggest you give this trilogy a chance. You don't necessarily need to have read The Vagrant to enjoy this one but it is recommended. As for this entry in the trilogy, I'd say it's a well-deserved four stars and I look forward to sinking my teeth into the final instalment soon. 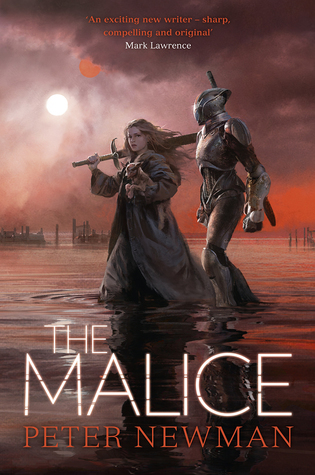 Sign into Goodreads to see if any of your friends have read The Malice.